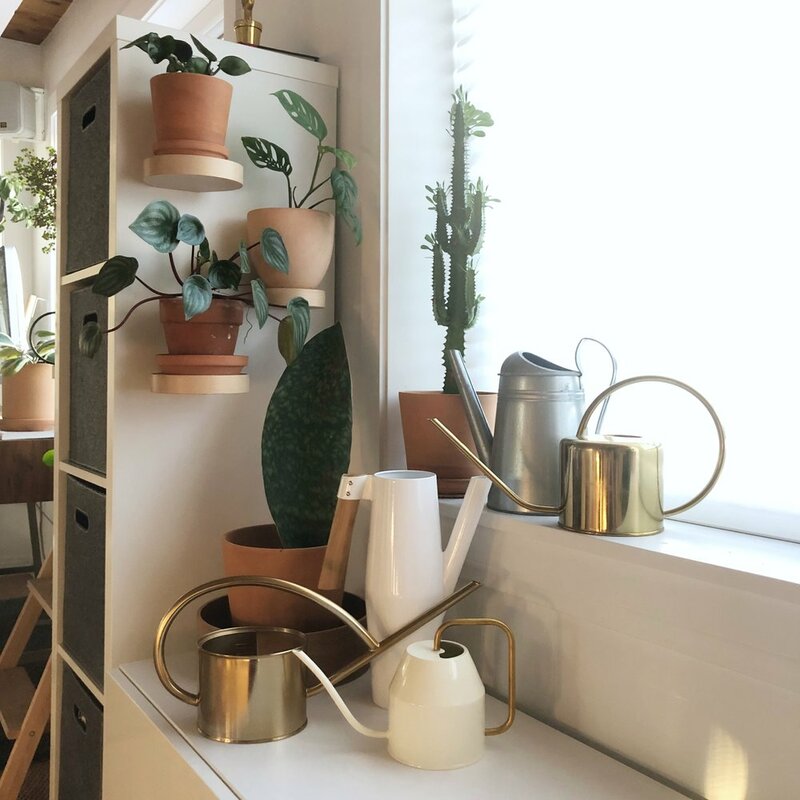 Last year, while researching the best care for my Fiddle leaf fig (Ficus lyrata), I came across a lot of sources that said these plants prefer filtered water. As an alternative, one could let the water sit out for 24 hours to “evaporate the bad stuff.” I proceeded to usually use filtered water from my refrigerator. However, the water comes out cold (and somewhat slowly) so I would either let it sit out to warm or even sometimes microwave it. Occasionally I would use tap water that I would sit out because I’d read that would work. As someone with a science background, I probably should have questioned that to begin with. My collection of watering cans. I use them all - the larger ones I fill with filtered water from the garden hose (read on), bring inside then fill the smaller ones. I prefer the smaller, long narrow spout for watering container plants. What is “hard” water? Some of us have a lot of calcium and magnesium carbonates in our tap water. The water tends to be more alkaline. Calcium and magnesium are not bad for plants (or us) in and of themselves, however theoretically if you are using them all the time on your plants you could be throwing the balance of your minerals and pH off. Some plants prefer less alkaline water as well. As for drinking, I prefer to filter it since I don’t like the taste. These compounds are not gas, and therefore they don’t dissolve if you let the water sit out. In fact, they will concentrate since they are salts. Softening your hard water (using a water softener) does not help this issue. Water softeners contain salt and this alters your plants’ abilities to use the water that’s available to them. Most people living in developed countries have treated water. I don’t want to minimize how important it is to have our water treated. There are many water-borne illnesses that kill millions of people around the world every year. Many of these diseases happen in places with untreated water. Most water is treated with cholorine. Chlorine comes in many forms, including compressed gas. This is where I believe the myth of letting water sit out came about. The chlorine in gas form will dissolve. However, most water treated with chlorine nowadays is in the form of chloramines. These are solid compounds, not gas. Not only will they not dissolve, they will concentrate if you let water sit out because some water evaporates. Some of us also have sodium fluoride in our water. I won’t get in to the debate over that here, but the idea is that chlorine and fluoride regularly used on (especially container) plants can concentrate over time. Results can be browning/yellowing of leaves. There are other potential ill-effects such as killing some of the good microbes in the soil. Bottom line: I’d rather not take the chance. Based on my research, my new system is to use a carbon filter. I’ve attached it to my garden hose so I can easily and quickly fill all of my watering cans and have them ready when I need them. You can find the filter I’m using on my Planty Products Recommendations page on amazon: https://www.amazon.com/shop/workhardplanthard. 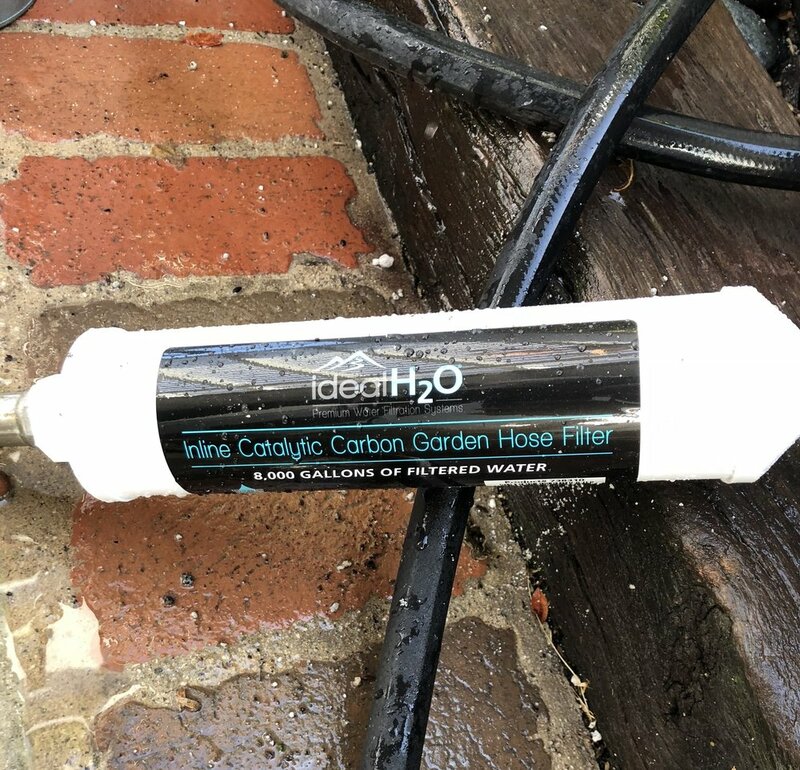 There are other filters available, including ones for your sink in case you don’t have an outdoor hose. This is the filter I’m using, recommended to me at my local hydroponic store. Not all carbon filters are the same but I haven’t fully researched that issue yet! I hope this helps dispel the myth of “dissolving the bad stuff” by letting water sit out. Have fun planting!